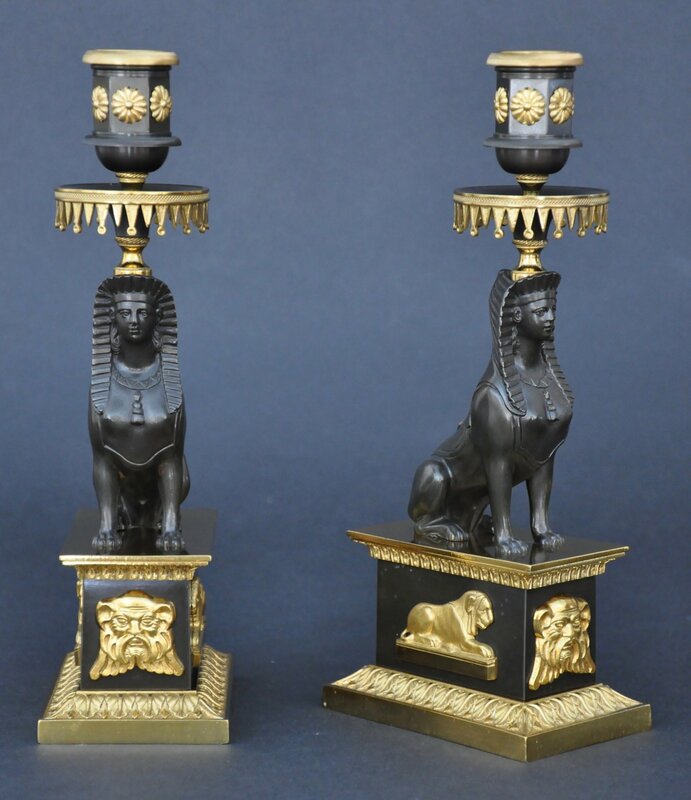 This exquisite pair of Regency candlesticks exhibits a number of ornamental details strongly influenced by illustrations in Thomas Hope’s Household Furniture and Interior Decoration published in London in 1807. The stamping on the back of the sphinx casting reads: PUBLISHED BY / G PENTON / JAN.Y 1 / 1808, one year after Hope’s published work. The faceted candle cups are decorated with rosettes and the drip plates are trimmed like the edges of curtains. Beautifully articulated sphinxes rest on rectangular plinths with finely cast mounts of reclining lions on the sides and a classical mask in the front.